Starting in April of 2013 we will have 310 full-body crypts available, as well as 312 cremation niches placed throughout the development. 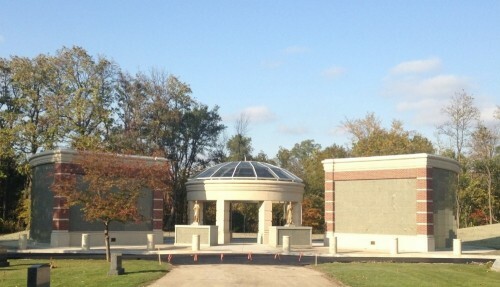 An interment service gazebo and benches accent the first phase of this wonderful and serene location. Our new mausoleum is a modern facility with a traditional look and an eye to the history of Saints Peter and Paul. SAINTS PETER AND PAUL CATHOLIC CEMETERY Originally founded in 1846 by Ss. Peter & Paul Catholic Church; the responsibility for the cemetery administration and operations were transferred to the Diocese of Joliet in 1982. Since then, the Diocese of Joliet has continued the rich tradition of faith and strong Cathoic values. While rooted in the history of the parish and Naperville, the cemetery has a strong vision of its future and is open to families in the neighboring parishes.